If it feels like you’ve heard Virginia Lewis’ story on NonDoc before, it’s because you have. What you may not have heard is Rep. Kevin McDugle’s. McDugle (R-Broken Arrow) met Lewis a little more than a month ago as the Tulsa-based victims’ rights advocate was gathering support for HB 1468 and HB 1470, both of which passed the Oklahoma House of Representatives unanimously Monday. They now head to the Senate, where a similar measure was denied a hearing last year. Lewis said that when she met McDugle he immediately offered strong support for the bills (embedded below), which would extend both the criminal and civil statutes of limitation for child sexual abuse until the 45th birthday of the alleged victim. Then, when Lewis emailed McDugle a letter to review before sending it to all House members, the former Marine offered an emotional edit. “He wrote back and said, ‘It looks great, how about this addition? '” Lewis recalled. What McDugle had suggested was a paragraph disclosing his own sexual abuse as a teenager in rural Oklahoma. At a press conference today in support of the measures, McDugle took to the podium after Lewis and said he feels the same of her. The first-term state representative said he was somewhere between 13 and 15 when the minister first abused him. McDugle, now 50, would not be able to request charges against his abuser under the new laws should they pass and take effect Nov. 1. But someone five years younger would be able. 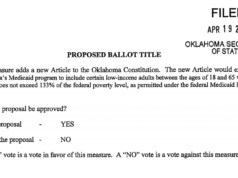 Whether HB 1468 and HB 1470 make it through the Senate this year will largely depend on public awareness and pressure on the issue, as well as the legislative chops of Sen. David Holt (R-OKC), a candidate for Oklahoma City mayor and the Senate author on the bills. McDugle said amendments added to HB 1468 could quell those objections this year. “I think that one of the biggest push backs we got last year and again this year is that there will be false allegations made for the benefit of some individual,” McDugle said. But HB 1468 now notes that anyone found to have made a false allegation could face a felony charge. The bills’ original author, Rep. Carol Bush (R-Tulsa), said she hoped the bills would be given a fair hearing in the Senate. She said Tulsa District Attorney Steve Kunzweiler had asked her to consider carrying the legislation if she were elected last year. McDugle and Lewis said it was Bush who had introduced them in the hallway several weeks earlier. He said the support he has received over the past two days has been enormous. “It’s amazing how many texts, how many Facebook messages I’m getting from people all over the world right now from people who have been abused and victimized and who are telling me their story,” McDugle said, before emphasizing how common child sexual abuse is. He said he is keeping track of his own abuser.